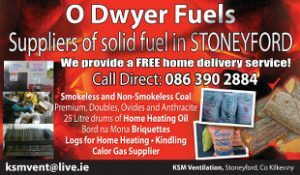 3.KSM Ventilation / O Dwyer Fuels, main St. Stoneyford. If you would like to advertise your Business or Service here please forward your details using the Contact Us link on the Main Menu. Nollaig faoi shéan is faoi mhaise do chách. We would like to wish all our customers and friends a holy and a happy Christmas. 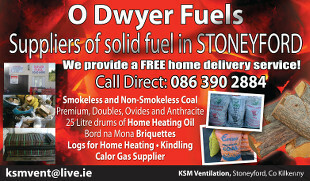 Suppliers of Solid Fuel, Calor Gas, Home Heating Oil, Bord na Mona Briquettes and Fire Logs. Open Xmas eve until 12 midday. Re-open 28th December.